Looking for research experience? Want to explore an honors project? Interested in working in a lab for credit? Need a summer paid position?Consider an ESF graduate student as a mentor! These positions range from research credit and honors thesis projects to volunteering and paid research technicians. Research credit is considered an independent project that the undergraduate mentee does extensive work toward with a degree of independence. The mentee may design the project or be given a project under the supervision of the graduate student mentor. Research credit is enrolled under XXX498 (department specific) by submitting a SCORE form signed by the grad student's advisor at any time during the semester. The student is given a letter grade at the end of the semester based on standards established on enrollment. Volunteering credit may be assigned through a research apprenticeship/internship and is typically considered to be an introductory experience into research data processing, organizing, entry, and management. An independent project is not expected. Volunteering credit is enrolled under XXX298 by submitting a SCORE form signed by the grad student's advisor. The student is given a pass/fail at the end of the semester. Volunteers in the Chemistry and PBE Departments must undergo a mandatory safety training seminar. The expectations for paid positions are established at hiring. Note: Undergraduates receiving financial aid should meet with a counselor before enrolling in research/internship credit to verify any change of award amount. Scroll through to read the available graduate student mentors and projects. Check out every listing - ESF has a strong interdisciplinary heritage. If you like trees, there may be the perfect project for you in Chemistry! If you like insects, Forestry grad students may benefit from your enthusiasm. Explore the descriptions and find some new skills waiting for you to learn. This list is updated as opportunities arise. Graduate students and other lab leaders: If you would like to update or add to this page, please contact Rea Manderino. I work on myrmecochory - the dispersal of seeds by ants, a common plant-ant partnership in North America’s deciduous forests. My research aims to characterize this mutualism along ecological gradients in the northern forest, and to identify the biotic and abiotic factors that may hinder or promote plant migration by influencing this interaction. I currently have forest litter samples and vegetation cover data, collected at conifer and hardwood forests from the Finger Lakes area in New York, which constitutes the core data base of my first field season. I also have a small collection of live ant nests intended to be used in seed removal experiments. Undergraduate students volunteering for this project will be helping me in extracting ants from litter samples, managing an invertebrate collection, setting up seed removal experiments, and digitizing data. This is a nice opportunity for you to add these skills to your toolbox, earn credits and have fun playing with ants while doing so. If you are interested, contact me at mgarias@syr.edu, and please include a CV on your email. Members of the Fierke lab are looking for two field techs to help us with insect pollinator research projects around New York State during the summer. These are paid positions! In the field, we’ll be setting up pan traps/sweeping and in the lab processing/pinning/ID’ing our samples. On field days, we’ll leave from campus to head to our sites. This position is paid, requiring ~40hours/week during the summer. • Have the ability to carry equipment and be outside for extended periods of time. If interested, please send your resumes to jhamidi@esf.edu with the days/times you can meet for an interview. My research focuses on native pollinators in restored wetlands. I seek to discover what native bee assemblages exist in restored wetlands like the Montezuma Wetlands Complex, and how the varying management regimes influence these assemblages in terms of abundance, diversity, and composition. Through this, it is my hope to learn more about how bees are using wetlands and the floral resources within these systems, possibly as a refuge in agriculture-dominated landscapes. This would provide new insight into how wetland management affects pollinators, so we may better understand how to protect native bees and improve best management practices, and offer further justification for the conservation and restoration of wetlands, especially near agriculture. Due to the nature of this work extending into the next semester or beyond, you would need to be a returning student. The details of the research are still being finalized, but at this point in time, the field season will be at least from May-September, depending on the phenology of the flowering plants at Montezuma. For monarch research, there will be additional field sites, possibly Iroquois NWR, Oak Orchard WMA, and Tonawanda WMA. Field work will likely be 2-3 weeks per month. Driving license required, and must not be allergic to bee stings (stings are rare, but precaution should still be taken). Previous entomological experience, particularly with bees, is a great help, but not required, so long as you can learn the methodology quickly and effectively. Possible funding for the position is still in progress. However, some compensation will be available for honors students. If you have questions, contact Molly Jacobson (mmjacobs@esf.edu) and Dr. Mike Schummer (mlschumm@esf.edu, or stop by Illick 204), and if interested please include a letter of interest, resume/CV, and unofficial transcripts in one pdf, addressed to both of us. A unique opportunity for a student to contribute to a Rare & Endangered Pollinator Survey, collecting & preparing insects from all major regions in NYS through the summer. This is a paid position. Work 40 hours a week from May 13th- Aug 23rd. I use green roofs as a model system to conduct experiments on the relationship between plant species richness, functional diversity, and ecosystem functions such as water use and nutrient retention. This experiment will involve a substantial amount of labor to build green roof microcosms and plant them with a variety of species that can tolerate the stressful conditions on a green roof. Over the summer I will measure precipitation inputs and runoff outputs of the planted microcosms, and collect runoff for nutrient analyses. Expectations for an Undergrad: At the moment I have a lot of repetitive construction labor to get the microcosms up and running (tool work, digging, carrying, planting), and data collection over the summer (reading rain gauges, emptying collection buckets, taking water samples). Looking for an undergrad that doesn't mind hard physical labor outdoors/repetitive tasks in the name of science. Ability to work independently after training is a must. This project has potential for an independent undergrad aspect down the road (this summer/fall or next). will not be available until the fall semester. your CV attached and briefly tell me why you think you are a good fit for this position. The Parry Lab is looking for full time techs for Summer 2019 (May-August) to assist with research on several different insect conservation and invasive species projects. General responsibilities will include: Assist with rearing caterpillars of several different species, collection of insects and other data from the field, foliage collection, data recording and entry. Should be able to hike off trail, enjoy the outdoors, be willing to work weekends, record data accurately, and be able to work independently. A car is a plus! All positions paid. Position 1: Syracuse based - Assist with gypsy moth experiments looking at adaptive change across its invasive range in North America. Some travel (Heiberg Forest and Lafayette Rd. field station). If interested, contact Dr. Parry (dparry@esf.edu). Position 2 & 3: Syracuse based - Evaluation of biological control of invading black and pale swallow-wort. Some assistance with gypsy moth projects. 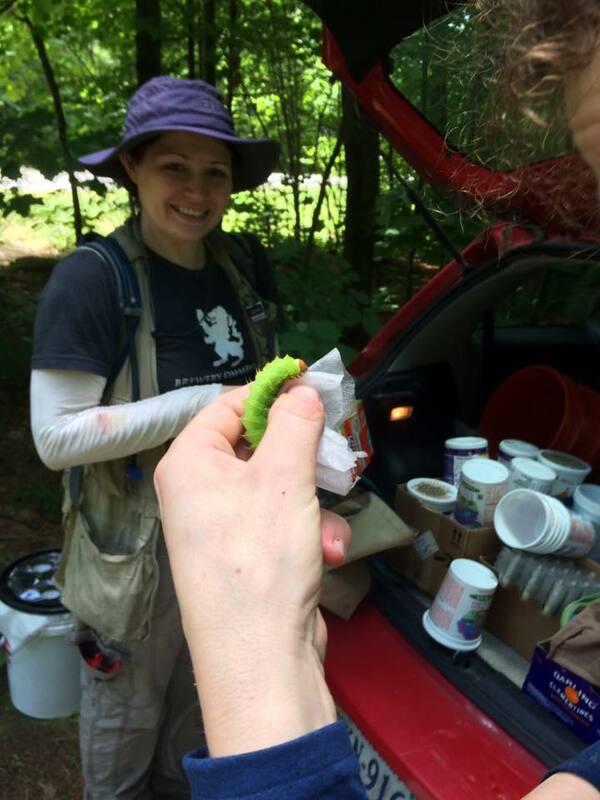 Help assess performance of caterpillars from the Hubbard Brook ice storm study (Project ISE). Assist with giant silk moth study. If interested contact Dr. Parry (dparry@esf.edu). There are potential independent research projects that could be used to fill EFB-498 (Independent research) requirements with each of the positions. As a Ph.D. candidate my interests include predator-prey relationships, population dynamics, species interactions, and conservation. My current project will examine the factors limiting reproductive success of piping plovers (Charadrius melodus) in southern New Jersey. The Atlantic coast population of piping plovers has more than doubled since 1986 due to intensive management efforts across the breeding range. However, the New Jersey population has remained at approximately 100 pairs since listing, despite recovery actions taken by wildlife agencies. The goal of the project will be to make specific management recommendations that will maximize ideal piping plover breeding habitat and minimize the effects of predation and human disturbance. My expectations of an undergraduate mentee are simple: I'm looking for someone who is willing to work hard and who will have great attention to detail. I am currently working on a coast-wide data collection smartphone app for piping plovers. The tool has the potential to streamline and standardize data collection across the entire range of the species as well as implications for collecting data for other beach-nesting birds. We will be working on meticulously entering data and testing the app so that users can be ready for the 2018 nesting season. If you are interested, please contact me at michelle.stantial@gmail.com. The Dovciak Lab at SUNY-ESF seeks undergraduate research aides to assist an NSF-funded project studying responses of sensitive montane forest ecosystems in the northeastern United States to changing environmental factors such as changing climate, land management, biogeochemical cycles, trophic cascades, and declining biodiversity. You will help us answer questions such as “How do tree species shift their distributions in response to global environmental changes?” while gaining valuable research skills. This is a perfect opportunity to gain valuable research experience for students in any department and level, and especially for students in EFB (covers EFB 498 or EFB 298 research credits). pH, extractable nutrients, CEC, etc. Please email Jordon Tourville (jtourvil@syr.edu) for any questions regarding details of the opportunities or stop by 302 Illick Hall. I'm researching effectiveness of biocontrol on the hemlock woolly adelgid (HWA), because the eastern hemlock, a unique and ecologically important foundational species, is being threatened by this invasive insect. I released silver flies into branch enclosures to test for success, based on predation and fly offspring, in Spring 2018. Students would go through HWA infested branches, counting the number of HWA found. Please send me an email describing why you are interested and your level of experience. (No experience is required, but familiarity with a microscope is preferred.) This opportunity is meant to earn you credit in your required internship 498 course. The research I’m conducting in Dr. Nomura’s lab revolves around investigating the genetic regulation of amino acid utilization in the opportunistic pathogen Pseudomonas aeruginosa. Aims of the project are to determine the genes involved, and the mechanisms by which said genes are regulated. Students will assist in the preparation of media, basic molecular biology techniques (PCR, gel electrophoresis, genomic and plasmid DNA purification, etc), screening of gene deletion mutants, and other tasks based on individual daily needs. Please contact me at jmshoytu@syr.edu. I'm a second year M.S. student here at ESF, and I'm also working on my MPA degree at SU. I'm most interested in land management and species conservation, and how politics intersect with these issues. My thesis research is focused on a case study of the 2018 Congressional election here in the NY-24 district. I'm conducting interviews with a diverse group of politically active people in the district as well as a media analysis of coverage around the election to analyze the connections and salience of conservation and other environmental issues in the election. I'm looking for an undergrad to help me transcribe interviews I have already conducted and assist me in recruiting more interview participants. The student will gain experience working on a qualitative research project and learn more about key methodological strategies in social science research. If interested, the student should send a resume and a brief statement of why they would like to participate to crcoffma@syr.edu. ​I use qualitative methods, GIS and species surveys, including techniques ranging from Participatory Action Research to standard interviews, group discussions and personal observation, to learn about Indigenous land issues in our region. I work closely with the Center for Native Peoples and the Environment and NYS DEC. I have a background in visual art, especially drawing, and for seven years following my undergraduate degree, I worked on a number of organic and food justice farms in the Hudson Valley and Finger Lakes in pursuit of regenerative food systems and a culture of nature connection. I have been learning about wild edible plants and survival skills. As I work toward a Society of American Foresters certification, I am learning ways we can help to care for forests and develop good relationships with the land where we are and people who live here. I also work with the ESF Botany Club. I would love to share with you about these experiences and involve you in any way, or assist you in your related pursuits. Let's go for a campus walk and taste some healthy plant gifts, or explore GIS apps! Please email me at ARober10@esf.edu if interested. My dissertation research involves rivers and marine connectivity in terms of diadromous (sea-run) fishes. This work focuses on how people perceive dam removal, and what drives receptivity to that given other priorities and interests. To address these social-ecological questions, I use quantitative and qualitative methods in the fields of ecological modeling, systems thinking, and environmental communication. For research apprenticeships (FOR 298), we can offer a variety of activities in the field and the lab. We will make several weekend trips to New Hampshire to collect leaf litter. Laboratory activities include processing leaf litter, analyzing soil texture, sorting roots from soil, sorting seeds from litter, identifying Neonectria species via microscopy, and entering and managing data. These do not require an independent project and are graded S/U based on hours worked (40 hours/credit). 1. It is important to understand the soil properties at our research sites. Samples from the Hubbard Brook Experimental Forest were collected in July and need to be analyzed for nitrogen and nutrient cations. Samples will be processed through sequential extractions and a digestion. 2. Roots from the soil pits excavated at Hubbard Brook this year can be used to complete a data set of roots collected from soil pits at Bartlett Experimental Forest. The distribution of root biomass is important to predicting forest productivity and nutrient uptake. 3. Are trees producing more leaves in response to fertilization? Which limits leaf production, N or P? Is there more of a response in young stands than old stands or in infertile sites compare to more fertile sites? We are sorting leaf litter by species and weighing them. These can be compared to pre-treatment data to analyze change over time due to nutrient additions. An intern on this project will learn to identify leaves by species, dry and weigh them, and organize and report the data. 4. Soil texture is a master variable that determines water holding capacity and affects nutrient cycling in ecosystems. We need to determine whether a pre-treatment to remove organic matter (by wet oxidation or dry ashing) is necessary to get accurate results. This project involves soil processing and analysis and data analysis and interpretation. 5. In the second year of nutrient treatments, we collected quantitative samples of leaf litter arthropods from all 13 of our sites. Using a dissecting microscope, sorting these arthropods to order (or possibly to family) would help to answer questions about the effect of nutrient additions (N, P, Ca) on the brown food web. 6. Video/photographic documentation of lab procedures: A student interested in environmental interpretation or science communication could help us document many of the lab procedures we find difficult to explain, such as root sorting, leaf sorting, ashing and digestion, ICP, and oxidizing soil organic matter prior to textural determination. 7. Our pre-treatment foliar data set is incomplete! There are archived samples in need of analysis. A student on this project would learn procedures for analyzing tissue chemistry using microwave digestion and inductively coupled plasma emission spectroscopy. Data analysis could include calculation of foliar nutrient resorption in response to our treatments (pre-treatment concentrations being an important covariate in the analysis). Contact Alex Rice (arice01@syr.edu) for more information.